Please note that at the end of Mass today, the Blessed Sacrament will be taken in procession to the Altar of Repose, where It will remain until the Good Friday Liturgy of the Presanctified. Please remain for a few minutes in prayer before the Blessed Sacrament before leaving for home—perhaps for the length of a Rosary. 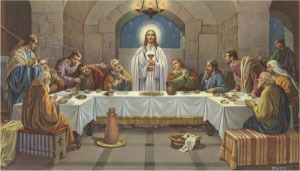 Be aware that only the priest will receive Holy Communion during the Good Friday Liturgy. Those of you who were at Mass on Sunday know that the Palm Sunday Gospel presented the events of Holy Thursday and Good Friday: In the context of the Passover meal, our Lord took Bread and Wine, and gave them to His apostles, indicating that these had been changed into His Body and Blood, as He had promised during the Passover of the previous year (John vi). “This is my Body, which shall be given up for you. . . . This is My Blood, which shall be poured out for the forgiveness of the sins of many.” “Do this in memory of Me.” He then went out, gave His Body over to those who sought His life, and within less than twenty-four hours, had poured out His Blood as He predicted. This evening's Mass then celebrates the anniversary of the first Mass, the establishment of the Most Blessed Sacrament of the Altar, and the delegation of our Lord's priesthood to the Apostles and those who would follow them. It is celebrated in white vestments, because even in the midst of our Lenten mourning, these are joyful events. It is important to note that these events focus on our relationship with God, and then only secondarily on our relationships with each other. Tonight we receive the Body and Blood of Christ, which, if we didn't eat and drink them, “we would not have life in us.” And that life is, of course the eternal life of the souls in heaven with God. So, without equivocation, we can say that tonight is a feast which celebrates to love of our God for His people—and, hopefully, of His people for Him. It would be heretical to do as the Modernists do, and downplay this love of man and God, in order to emphasize good will among men. Indeed, that is the major error of the New Mass and the new religion which it represents. But, we know that most heresy contains more truth than error—otherwise it wouldn't be attractive to people; it wouldn't make any sense at all. Consequently, after we recognize this as a feast of God's love, we should also recognize it as something which calls for love of neighbor. After all, if God can love our neighbor, we ought to be able to see some good in him. If we come together and share the same banquet with our divine lover, we ought to be on congenial terms with one another. If we receive the same Holy Communion, and take on the substance of the same Lord, we should recognize that we are becoming more and more alike—that, in spite of superficial differences, we are becoming one with each other in the same God. This is the first day of what we call the “Sacred Triduum” —Holy Thursday, Good Friday, and Easter. It is primarily a day of joy, although mingled with the sadness of the impending events of Good Friday.